Wells Fargo accidentally sent apology letters to 38,000 people in error after the bank was caught foisting auto insurance on more than 800,000 customers who only wanted to take out auto loans. Tacking insurance onto the loans were part of the bank's "cross-selling" practice of offering products across different segments - which also included opening millions of credit card and bank accounts for people who never asked for them. It gets better: the expense of the unneeded auto insurance (which covered collision damage) pushed some 274,000 Wells Fargo customers into delinquency and resulted in almost 25,000 wrongful vehicle repossessions. And the cherry on top: "among the Wells Fargo customers hurt by the practice were military service members on active duty." In some cases the bank did just that. In most cases, nobody noticed and the scheme continued: "The Oliver Wyman report indicated that many customers appear not to have notified Wells Fargo of the redundant insurance. This may have been because their payments were deducted automatically from their bank accounts and they did not spot the charges." The bank ended up paying $185 million to regulators and settled a $142 million class-action lawsuit for more than three million fake accounts opened up by Wells Fargo employees to meet sales quotas. The 38,000 erroneous letters were allegedly part of a "coding mistake" caught by the vendor responsible for the communications, reports the New York Times. "We will work with our vendor to ensure these customers receive the appropriate communication — including any refunds they're eligible for," said Bank spokeswoman Catherine Pulley, who also confirmed that the bank mistakenly sent a check to a non-customer. The bank acknowledged that they signed up hundreds of thousands of customers for auto insurance they did not need - which the bank says they will pay a total of $80 million to make amends to affected customers. "We'll continue working very closely with our vendor and we expect the remediation to be substantially complete by the end of second quarter, 2018," said Pulley. 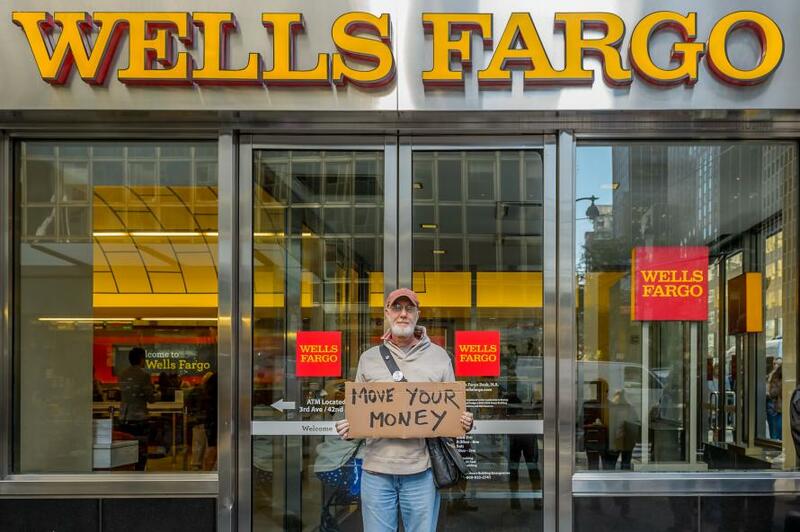 What's going on at Wells Fargo? On top of the credit card, bank account, and auto loan "cross-selling" scams, the beleagured bank also offered refunds to for up to 110,000 customers who were unfairly charged fees to lock in interest rates on mortgages. In early February, the Fed said it would bar Wells from expanding its assets beyond their end-2017 level until it "sufficiently improves its governance and controls." The Fed also demanded that Wells replace three current board members by April and a fourth board member by the end of the year. The release says the board of directors must also improve its oversight practices. The bank will not be allowed to grow until the Fed approves a detail plan of action to be submitted by the bank. "The enforcement action we are taking today will ensure that Wells Fargo will not expand until it is able to do so safely and with the protections needed to manage all of its risks and protect its customers,” Yellen said in a statement. "The enforcement action we are taking today will ensure that Wells Fargo will not expand until it is able to do so safely and with the protections needed to manage all of its risks and protect its customers." As we wrote several weeks ago, Wells pursued a business strategy that prioritized growth over managing risks and offering sufficient oversight of the firm's lending practices. As a result, the firm cheated customers of its auto-lending division and also overcharged some mortgage borrowers. And that was AFTER the cross-selling scandal mentioned above. The bank is also facing a criminal probe into its foreign-exchange desk, which allegedly overcharged its large corporate clients. The firm also lacked "an effective firm-wide risk management framework in place that covered all key risks." This, the Fed says, prevented the serious compliance breakdowns from being adequately reviewed by the board. 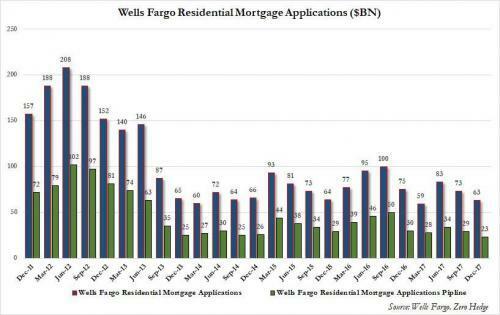 Meanwhile, in January we showed that Wells posted the worst mortgage numbers since the crisis - so maybe the Fed's new "growth restrictions" on the bank weren't needed after all.